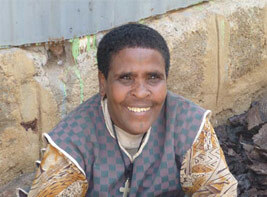 Taje and her family of four girls are one of those families that instantly have an impact on you. We have over the years helped them with donations of clothes, and four years ago you supplied Taje with a new house, but like many families they have just been surviving. This year two of the girls have found work; Faglis is working as a teacher’s assistant in the day care centre and Truye is working on the land. The two youngest girls, Enana and Beletu, are in school and day care. Generally things are looking better for this family; however our main worry was the health of Taje, as she is looking dreadfully thin and gaunt. Shocked to see her sleeping on just a broken wire divan and two of the girls sleeping on the floor, we purchased two beds and some bedding. We also arranged and financed for Taje to have a one year supply of Tef (grain) and half a litre of milk a day in the hope that this will build her strength and immune system. Taje, when well enough, has been able to find regular day work.